To be clear: Don’t think Pineda is cheating. #RedSox were accused of the same thing last year and defended their use. Same is true now. Love that some people are outraged that Farrell isn’t a ridiculous hypocrite. Remember, by the way, the Blue Jays never complained about Buchholz. It was their announcers. Ellsbury RBI single and it’s 4-0 Yankees. Ross, Capuano, Buchholz and others also mentioned pitchers using substances for grip. Alternative is more HBPs, etc., so it’s accepted. If Pineda was guilty of anything it was being too obvious about it. In an otherwise dull game, insta-controversy reigns. Joel Hanrahan will workout for teams next week. That was from MLB spokesman Pat Courtney @Joelsherman1 reported similar language from VP Joe Torre earlier. John Farrell was asked if he ever used anything on the ball in cold weather. “Never,” he said. “Never.” Then he started laughing. Direct from the dugout as the rain starts, I'll be joining the @NESN #RedSox pre-game show in a minute. According to an MLB source, Koji Uehara's medicals (shared by MLB teams) on his shoulder have been a concern but has pitched through it. Beltran with a deep blast to RF. No Stadium cheapie there. 2-0 #Yankees . Pierzynski goes 2nd deck to RF and it’s 2-2. Ken Rosenthal reports Sox made 4-year, $70 -$80 mil offer to Jon Lester. Why offer a deal he will refuse? Two-run homer for McCann, another poke. 6-2 Yankeee vs. the moribund #RedSox . Lackey getting hit hard today. All the damage by the #Yankees from Ellsbury, Beltran, McCann and Soriano. 8 for 12, 4 HRs, 6 RBIs. They’re handing out “true Yankee” tags like schedule magnets today. Johnny Pesky's 2004 WS ring sold for $69 ,000. His 2007 ring sold for $29 ,000. Sold by Hunt Auctions working on behalf of Pesky's son, David. NEW YORK — The Red Sox and ace lefthander Jon Lester broke off contract extension talks at the end of spring training with an agreement to leave the door open to further negotiations. At the time, Lester and general manager Ben Cherington described the sessions as amicable. On Saturday, Fox Sports reported Lester rejected an offer of four years and $70 million and that the sides would not speak again until after the season. Fox suggested that Lester would leave the Red Sox as a result of the lowball offer. But Lester rejected that premise, saying he remains optimistic of staying in Boston. Lester, who can become a free agent after the season, has repeatedly said he would give the Red Sox a “hometown discount” on a new deal. But four years with an average annual value of $17.5 million would represent a significant discount in both value and length of contract. Cole Hamels, a pitcher of comparable age and accomplishments, took a seven-year, $153 million deal with stay with the Philadelphia Phillies in 2012. Max Scherzer, another good comparison to Lester, rejected an offer of six years and $144 million from the Tigers earlier this year. Lester is 101-58 with a 3.74 ERA over nine seasons. A 2.11 ERA in 13 postseason games — including 0.43 in three World Series starts — adds to his value. Lester has a 2.57 ERA and 1.09 WHIP in three starts this season. Koji just finished playing catch. Threw some pitches from flat ground. Seemed to be normal effort. 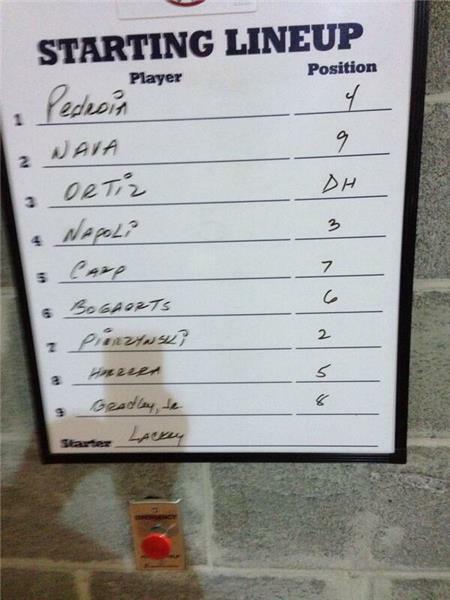 There has to be concern on Pedroia for him to be out of the lineup. He goes back to Boston for tests on his lsore eft wrist. Uehara and Pedroia leaving the team tonight to return to Boston. NEW YORK — Red Sox second baseman Dustin Pedroia was scratched from the lineup before Sunday night’s game against the Yankees and returned to Boston with a left wrist injury the team fears could be serious. Pedroia was injured during the home opener against the Milwaukee Brewers on April 4. When Carlos Gomez slid into second base breaking up a double play in the ninth inning, Pedroia was upended and came down with his wrist bent at an awkward angle. Pedroia is 5 for 36 at the plate since and the injury has gotten progressively worse. Team doctors will exam Pedroia on Monday at Massachusetts General Hospital and administer an MRI. “He went down to hit early [Sunday] and the soreness continues to persist and probably gain in intensity,” Sox manager John Farrell said. The Red Sox do not believe Pedroia aggravated the injury since it occurred. But the All-Star is off to a poor start as a result. He is hitting .236 and had yet to draw a walk in 55 plate appearances. Pedroia has only one RBI. The Red Sox started Jonathan Herrera at second base on Sunday. Ryan Roberts, who started at third base, also has experience at second. The Red Sox have used Heiker Menses, Justin Henry, Brock Holt and Mike McCoy at second base in Triple A Pawtucket. Holt and McCoy have major league experience. Pedroia tore the ulnar collateral ligament in his left thumb during the first game of 2013 and had surgery following the season. There was a positive development for the Red Sox regarding closer Koji Uehara, who has not pitched since feeling discomfort in his right shoulder on Friday. Uehara threw for 10 minutes at Yankee Stadium on Sunday afternoon and was pain free. He, too, returned to Boston and will be examined on Monday. But the Red Sox expected Uehara to rejoin the team in Chicago for Tuesday night’s game against the White Sox. Farrell said the Red Sox would want Uehara to throw in the bullpen before he is cleared for a game. He last pitched on Wednesday. “Today overall was very good news regarding Koji,” Farrell said. Uehara threw from 200 feet and then threw fastballs and splitters from flat ground. “He was really able to generate good arm speed and he’s past some of the concerns mentally that he had,” Farrell said. Right fielder Shane Victorino took a step forward in his return from the disabled list. Victorino, out all season with a strained right hamstring, ran the bases, played catch and took batting practice before the game. He will be in Boston on Monday to work with physical therapist Dan Dyrek in anticipation of starting a rehabilitation assignment with Double A Portland on Tuesday. The Sea Dogs host Binghamton on Tuesday night at Hadlock Field. Victorino said on Friday that he would need 2-3 games in the minors before returning to the Red Sox so he could get his timing down at the plate. If all goes well, Victorino could rejoin the Red Sox for the start of their homestand on Friday against the Baltimore Orioles. 66 degrees at first pitch for #RedSox - #Yankees . Warmest of the year for the Sox. Could be in the 30s in Chicago on Tuesday. And the #RedSox remain the only tam not to score in the first inning. And the #RedSox remain the only team not to score in the first inning. Wow, a #RedSox center fielder who can throw nails one who couldn’t. And the run does not score. What a throw by JBJ. Beltran needed to hustle there and that was a bad tag-up by Ellsbury. Ball was not that deep. JBJ needs to be on the roster. #RedSox run into another out. Over-aggresive send there with Bogaerts on deck. Gardner has the best arm in that outfield. Not the guy to run on, especially there. Nova was getting hit hard, too. Bradley nailed by Gardner at plate eliminating potential 2nd run in 2nd inning. Aggressive decision by Butterfield.